South Lincoln EMS is located in the Southwestern corner of Wyoming. 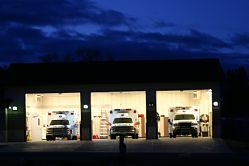 Our ambulances provide care for multiple communities in the Southern half of Lincoln County, encompassing an area of 3,000+ square miles, and serve a population base of over 5,000 people. Our ambulance service prides itself on providing excellent patient care that is both compassionate, and on the forefront of new standards of care. SLEMS is able to care for the very sick and injured patients. Our staff receives over 500 hours of education yearly, in order to help ensure that they are both knowledgeable and skilled at handling a variety of emergency situations. Our services provide ALS care that are available 24 hours a day, 7 days a week, 365 days a year.